May is the fifth month of the Gregorian calendar and the third month of Spring’s rule. The name of the month is garnered from the Greek Goddess Maia, the most important of the Seven Sisters (the Pleiades), and (some say) the mother of Hermes. Some form of this Goddess name is known from Ireland to India. 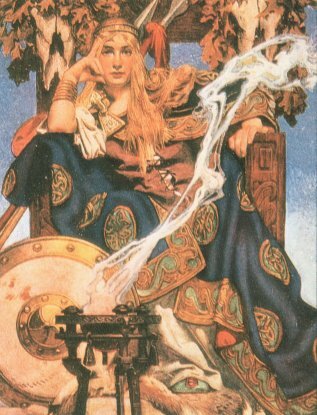 She can be equated with the Irish Queen Medb or Celtic Meave. The Romans called her Maius, Goddess of Summer. This was the traditional month of “wearing of the green” in honor of the Earth Mother’s new garment, and of fornicating in plowed fields to encourage the crops. Hawthorn, her sacred plant, blossoms during this month. Artemis, Diana, Faunus, Flora, and Pan also have dominion over this month. The Anglo-Saxons called this month Thrimilcmonath, “thrice-milk month.” In England, May was also called Sproutkale. Winnemanoth, “joy month,” was the Frankish name, and the Asatru name is Merrymoon. The Irish call May Bealtaine or an Ceitean, the first weather of summer. The two weeks before Bealtaine is ceitean earrach, spring May-time, and the two weeks after Bealtaine is ceitean samhradh, summer May-time. Bealtaine, also associated the God Bel, means ‘the fires of Bel’. In old Japanese calendar, the month is called Satsuki (皐月). It is also a common name for females. In Japan, there is the so-called May sickness, a kind of sickness where new students or workers start to be tired of their new schoolwork or jobs. It is due to a Japanese custom that all school years and fiscal years start on April 1st. In Finnish, the month is called toukokuu, meaning “month of sowing”. In Slovene, it is called veliki traven, which means the month of high grass. The first Full Moon of May is called the Flower Moon. It shares the names Planting Moon, Hare Moon, Pink Moon, and Green Grass Moon with April. The May moon is also the Bright Moon, Dryad Moon, the Moon When the Pony Sheds, the Frogs Return Moon, and Sproutkale.